All prices quoted by TST are net prices and subject to change without notice, and will be billed at the prevailing price. Dealers should contact TST/IMPRESO for their current price list. All dealer price lists are available online with user name/password. Log into dealer account at www.tstimpreso.com. Contact service@tstimpreso.com to obtain your login info. Given normal market conditions, TST will always attempt to provide a 30 day notice on all price increases. All Special Price Quotes (SPQ’s) should be requested through a TST Regional Sales Manager or from your TST Customer Service Specialist. Quotations over 30 days are subject to review before acceptance, and available for extensions given no changes in the market. The information contained in the SPQ is confidential and proprietary to TST/IMPRESO, Inc., and is furnished in confidence to the recipient with the understanding that it may not be reproduced or used by recipient, in whole or in part, for any purpose other than evaluation of a transaction with TST/IMPRESO. The recipient agrees not to provide the information contained to any other party. Standard turnaround time for Special Price Quote requests is 24-48 hours. Upon credit approval: Net 30 days from date of invoice. Invoices beyond 30 days are subject to credit hold on open orders, pending payment and release by TST/Impreso Accounts Receivable. Invoices dating 60 days or more are subject to a late fee of 1.5% (or the maximum allowed by individual State) interest per month on the outstanding balance, and will continue to accrue until full payment is made. Discounts are not allowed on current invoices when account status is past due. Discounts are not allowed on freight/shipping costs. Returned Checks will incur a $75.00 NSF charge for each check returned, and invoice will remain in “unpaid status”. All orders under $150.00 will be accessed a $15.00 Pick|Pack|Ship charge. All orders should be placed via Fax, email or through TSTIMPRESO.COM online portal. Phone orders will be accepted, but NOT SHIPPED, until either a Purchase Order is received via fax, email, etc., or a written confirmation of the order has been approved (signed or initial) by the customer, and sent back to Customer Service as an acknowledgement of the order phoned in. MasterCard, VISA and American Express accepted. Discounts are not allowed with Credit Card payment. All Credit Card paying accounts require TST Sales and Credit Department approval. Based on TST Plant location from which product is shipped from, or being picked up from. Order is subject to credit approval for processing. Pick Up’s must be made within 5 business days of original order, or may be subject to cancelation. S: Special Make Item. Not stocked, and must be produced to order, with a 1 (one) pallet minimum order. X: Items which are stocked and available from Coppell, TX Manufacturing plant only. Prices are FOB TST/IMPRESO distribution points unless otherwise specified. Contact your TST Regional Sales Manager, or customer service for detailed freight information. Carrier selection is at the sole discretion of TST/IMPRESO. TST/IMPRESO is not responsible for “dry run” charges from 3rd party carriers. Unless approved prior to delivery, additional charges will apply to the following, but not limited to Residential, Inside Delivery, Limited Access, Lift gate & Pallet Jack Service, Re-Delivery, Sort & Segregate, Trade Show/Convention delivery, and/or Stacking services will apply. Incorrect Address charge of $25.00 will be assessed for wrong address provided, in addition to any carrier fees associated with the delivery. Charges will be added to original invoice, or billed separately detailing service requested at time of delivery. 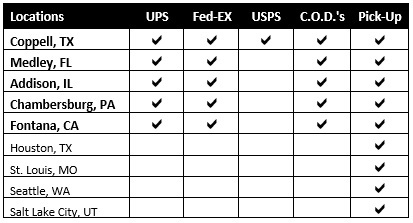 TST will not make any adjustments or accept any claims without delivery receipt verification, and if not provided, any disputes are exclusively between TST Dealer and the receiving customer. It is the customer’s responsibility to initiate any claim against the carrier, when the customer has selected the carrier. A $5.00 CPU charge will be added from all warehouse locations. (Excludes manufacturing plants). Most Proof of Deliveries are available within 48 hours via the TST/IMPRESO online business portal. All P.O.D. requests through TST Customer Service will incur a $15.00 P.O.D. charge. Contact your TST Customer Service Specialist if a special request is needed. Products may not be returned without authorization from TST/IMPRESO. All returns must reference a Return Authorization number (RA). 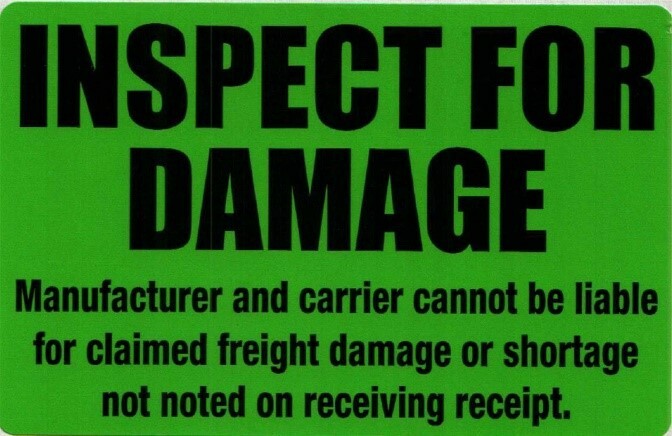 All claims must be made in writing within 60 days after shipment, including but not limited to, any type of defect, damage or shortage. No returns will be accepted on custom or special make items, unless it is a manufacturer’s defect. A 20% inspection and restocking charge will be applied against your account for the total value of the returned merchandise. Customer is responsible for all freight, on both outgoing, and incoming return. Failure to make a claim within the stated period shall constitute irrevocable acceptance and admission that the goods fully comply with the terms, conditions and specifications. Once an RA has been provided, product must be returned within 14 days. Beyond this time, claim file is subject to being closed. For any invoice disputes, contact your Customer Service Specialist for a formal inquiry. If the dispute warrants an adjustment, a Credit Authorization form will be completed, and a corresponding Credit number will be provided for submission with payment. Deductions taken without prior authorization will be charged back to dealer account. All disputes must be requested for inquiry within 30 days of invoice. All special orders or custom runs will require customer signature on New Item Production Specification form. TST/IMPRESO will make every effort to produce the number of boxes contained on the special order, but reserves the right to exercise the industry standard custom run of 10% over/under policy considering raw material roll yield, pallet configurations and other efficiency factors surrounding the specific production run. Custom make items have a no return policy, unless there is a determinable quality issue with respect to workmanship or performance.